Drew majored in drama at NYC's "Famed" High School of Performing Arts (visit his tribute site here) graduating with honors in 1979. His training, and over 30 years of experience, provide him with powerful interpersonal and communication skills; the foundation of his leadership and work. He's a true triple threat. A formidable talent in video, graphics and animation, he also excels at set design (real world & 3D virtual), photography, copywriting and editing. He’s a director, performer, vocalist and percussionist, who performs regularly throughout the area. 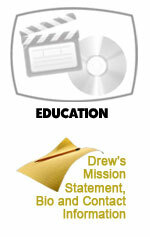 Drew was appointed Film Commissioner of Citrus county in November 2008. He sits on the board of directors for the Partners for a Substance-free Citrus, Citrus 20/20, the Greater Ocala Advertising Federation and the Performing Arts' Alumni Association. He's active in Hospice as a patient support and vigil volunteer, is a counselor at Camp Good Hope, and is among the first to participate in the volunteer program at Kids Central in Ocala. He looks to serve his community in every way he can. Contact Drew by phone at (352) 476-2721 or eMail him here.